The colours we use in our homes can have a significant effect on our emotions and the same can be said when it comes to incorporating different textures into your décor. Whether you want to create a relaxing room or an energizing space, you can use certain textures and décor styles to accomplish this. Texture is key when it comes to creating a particular ambience in a room. One way you can use texture is to create a room with a feminine or masculine ambiance. 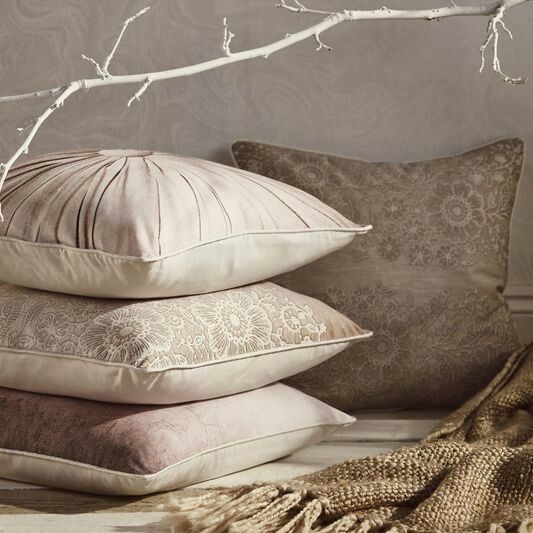 For a feminine atmosphere, use a combination of silks, satins and velvets and combine them with rich embellishments. For a masculine touch, opt for rustic metals and rich woods. If you want to transform a cold room into a comfortable, welcoming space, layering different fabrics and textures is the key. Cushions and throws are a great place to start. One way to create a luxurious, comfortable space is to contrast hard and soft textures such as a sumptuous throw with a leather chair. Rugs are the perfect way to add texture to a room and create a polished look. Combining textures can help you to create a certain mood and if you are dealing with a creative space for example a home office, you will want to create a professional space but you may still want to retain an elegant feel. The easiest way to achieve this is with a gloss finish paint. Once you have created this backdrop, you can contrast it with stylish metallic elements to add depth. You don’t need to go overboard with textures to transform the mood of a room. It could be something as simple as choosing the right wallpaper design for a feature wall or swapping out polyester cushions for satin. For the ultimate in luxury, choose a wallpaper with metallic threads or glitter highlights to adorn the room with a subtle shimmer. The secret to getting it right is using different combinations and don’t forget to include glass, metals and ceramics as well as fabrics to create the overall look. Creating a particular mood or ambiance in your home is simple and you don’t have to undergo a complete décor overhaul to get it right. From a striking feature wall to new cushions, small touches here and there can make a big impact.